Today one of the definitive Irish Traditional Songs sung by the regal Mary Black and an extraordinarily powerful Poem by an Irish Poet of world stature, Eavan Boland. 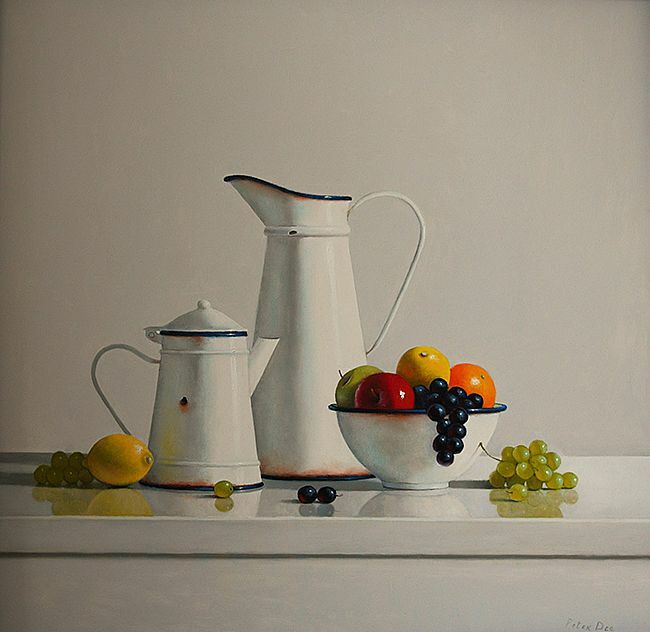 The Painting today is by a contemporary Irish Artist, Peter Dee, whose arresting and highly covetable Still Life works are the fruit of deep contemplation and confident technical accomplishment. She Moves Through The Fair is a Song that we will never get to the bottom of. It contains details of everyday life and a mysterious, swirling, intermingling of the known and supernatural Worlds we all move within. There are some sorrows, some griefs, that can only be borne through Song being too deep for common speech. The common speech of hand clapping dealers striking bargains at the fair. While we move, half-blind, through our lives the stars look down and the swans fly over the lake. All the while the soft fluttering of moths fill the night and dew will glisten on the meadow. While we bear our burden of loss and longing the wide world turns and turns oblivious. All as we move through the fair. Mary Black’s singing embodies the humanity and the other worldliness of the song with glowing assurance. Mary Black can flat out sing! Eavan Boland’s Poetry is characterised by fierce intelligence and a determination to fearlessly examine the toxins of Ireland’s history as understood and experienced by a modern Irish Woman. So, it is a Poetry which utters outrage, anger and bewildered frustration as well as ease and joy. I sometimes feel as if her work has served to redraw the map of Irish Poetry – significantly expanding the imaginative territory and cutting a path for others to follow. The Poem I have selected today is the work of a Major Poet. a man set out from the workhouse with his wife. He was walking — they were both walking — north. She was sick with famine fever and could not keep up. He lifted her and put her on his back. He walked like that west and west and north. Until at nightfall under freezing stars they arrived. In the morning they were both found dead. Of cold. Of hunger. Of the toxins of a whole history. But her feet were held against his breastbone. The last heat of his flesh was his last gift to her. Let no love poem ever come to this threshold. praise of the easy graces and sensuality of the body. Their death together in the winter of 1847. Also what they suffered. How they lived. And what there is between a man and woman. And in which darkness it can best be proved. Helen Harrison is an Irish Poet whose work I admire for its lovely evocations of the dignity and Wonder present in, ‘Everyday Life’. I recommend her collection, ‘The Last Fire’ published by Lapwing. I chanced upon a copy of Ron Carey’s debut Poetry Collection, ‘Distance’ when it was published by Revival Press in 2015. I must have nearly read the whole marvellous collection in one gulp! These are Poems that will stay with you. Ron’s site can be found at roncareypoetry.com. This entry was posted in Folk Music, Ireland, Music, Paintings, Poetry, Posts For St Patrick and tagged Eavan Boland, Helen Harrison, Mary Black, Peter Dee, Quarantine, Ron Carey, She Moves Through The Fair by Thom Hickey. Bookmark the permalink. Thanks for the Irish songs, poems and paintings, all very good and moving. Thanks, I haven’t listened to Mary for years! Quarantine is a very sad and moving poem.